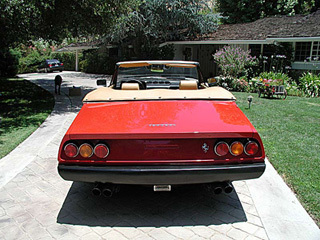 Sadly, the Ferrari developed rust in the main frame members, and simply was never going to be worth enough money to justify the immense job of repairing it. 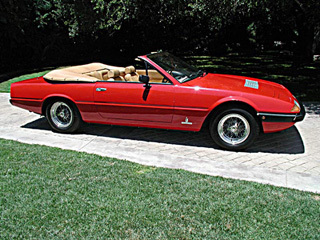 So we donated it to the Peterson Auto Museum, on Wilshire (ironically that’s where we bought it) and they plan to mount and display the V12 engine as an example of Italian engineering excellence. We’ll let you know when it’s on display. A friend and I went to the Peterson Auto Museum on Wilshire last Fathers Day, on a whim. 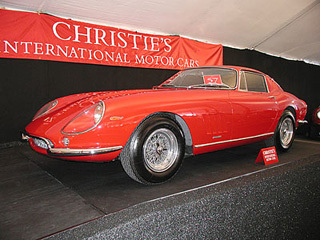 I have a friend who works at Christies auction house in New York, and she had sent me a catalogue of an auction Christies was having at the Peterson of rare and exotic cars. Since the catalogue allowed us to get in free, I took my buddy Rusty Goldberg to go see some cool cars. About halfway through the parade of Ferraris, Duesenbergs, and Packards we spotted this lonely old Ferrari stuck in a corner. 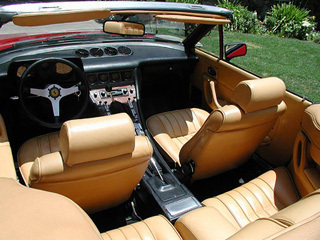 It was unwanted by the cognoscenti (Ferrari purists) because it had come out of the factory in 1975 as a 365 GT4 2+2 coupe, and been later converted into a convertible in Southern California. The owner had also died two years earlier, so it hadnt been driven in two years, needed new tires, some suspension work, the paint wasnt perfect, the trunk wouldnt stay closed, etc. Two hours later, Rusty and I owned a Ferrari, much to the consternation of our wives. 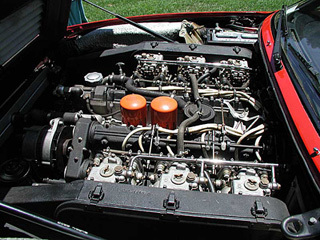 I had always wanted to own a 12-cylinder Ferrari, but it had been out of my price-range. 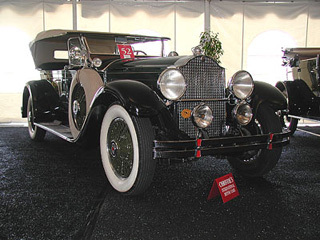 This car has essentially the same engine as a Daytona, a 12-cylinder motor with four overhead cams and six side-draft two-barrel Weber carburetors, with a five-speed stick. It puts out about 350 horses, and pulls effortlessly (if noisely) to 7500 rpm. 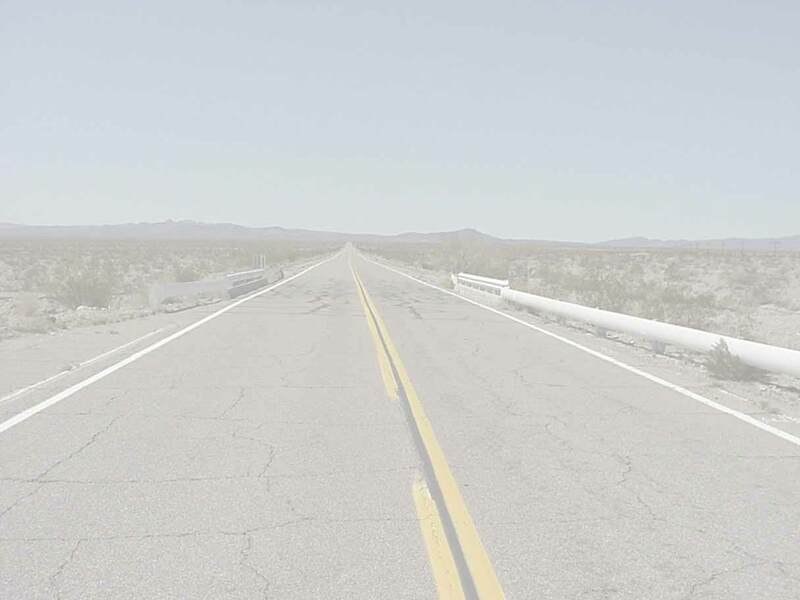 Ive taken it to about 115 miles per hour, and the engine was loafing, so its supposed top speed of 155 seems well in reach. I'm not sure I want to go any faster in a car that has a lot of 25-year-old parts. After some suspension work, new tires, a lot of elbow grease and some yelling, it looks pretty good. We drive it every day, and it attracts a lot of attention. Its only not started a couple of times, and I took it up to Santa Barbara and back in one day recently, with nary a burble. 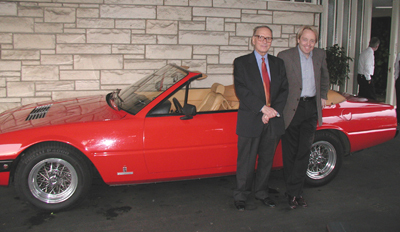 Heres Ennio Morricone with the Ferrari, at the SCL Oscar reception. 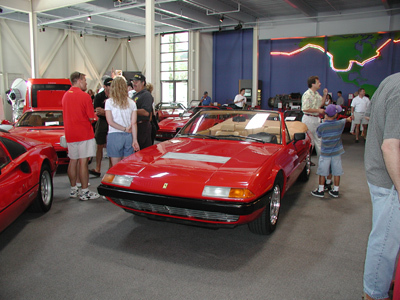 Our cars first prom: the Ferrari Clubs picnic at the Santa Monica Museum of Flying. 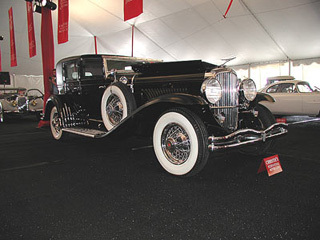 Here are some cars at the auction that we didnt buy.